On a recent Friday, in Washington, D.C., the New America Foundation issued a report on "Countering Domestic Radicalization." A few hours later, the Bipartisan Policy Commission released a report on "Preventing Violent Radicalization in America." A week later, Google hosted an extravagant "Summit Against Violent Extremism" in Dublin. You can expect to hear a lot more of this in the days and weeks to come. Ten years after September 11, the conversation has shifted away from traditional counterterrorism and toward "countering violent extremism," known as CVE. The reasoning behind CVE is fairly easy to understand. Advocates say it's better, for both budgetary and social reasons, to prevent people from becoming terrorists in the first place than to arrest them after they have committed a crime. It's the triumph of Doctor Phil over Jack Bauer. Traditional counterterrorism targets people who are already taking active steps in pursuit of illegal activities, regardless of their religion, and arrests them before they can do harm. In contrast, CVE seeks to prevent violent thoughts from taking root in the minds of ordinary people who are not actively pursuing illegal activities. And by ordinary people, everyone taking part in this conversation means Muslims. This summer's think tank reports are not the worst examples of this kind of approach. Each contains a combination of astute insights and well-intentioned policy recommendations. Many of those recommendations are oriented toward engaging Muslims rather than alienating them by singling them out for enforcement. But both reports drive this point home in an unfortunate way, by talking exclusively about Muslim radicalization and not, for instance, white supremacy or the sovereign citizen movement. Allowing for imperfect data, the percentage of Muslims who have a favorable view of Al Qaeda appears to be no larger than the number of white Americans who characterize themselves as racist. Yet no one has ever once asked my opinion about how to keep young people from sliding into Odinism, or neo-Nazi beliefs, even though incidents of racist and anti-Semitic violence far outnumber incidents of jihadist terrorism in the United States. If the first step in making Muslims feel less alienated is to single them out for remedial social engineering, then we have a problem before we even start. Once you get past this inherent contradiction, the next question is whether government and policymakers have a track record that suggests they can successfully navigate the waters of Muslim politics, ideology and belief in order to discourage radicalism and encourage moderation. During the Gulf War, U.S. military commanders allowed the Saudi government to run a "cultural exchange program" on base with American soldiers near Riyadh. In reality, the program set out to convert those soldiers to Islam, reportedly with great success. Leading the charge was a Canadian Muslim named Bilal Philips, who has since become an international pariah, banned from traveling to the U.K. and Germany over controversial interpretations of Islamic law on such issues as homosexuality and child brides. In my new book, Jihad Joe: Americans Who Go to War in the Name of Islam, I reveal for the first time that another preacher given full access to U.S. soldiers in Riyadh, an American Muslim known as Tahir, was later discovered to be a member of Al Qaeda. From the 1990s through 2003, both Republican and Democratic politicians embraced Abdurrahman Alamoudi, then-leader of the American Muslim Council, who was chosen as a partner in a number of government programs, from Muslim military chaplains to State Department goodwill efforts. Alamoudi is today serving a prison sentence for trying to assassinate the crown prince of Saudi Arabia. The Pentagon even hosted Anwar Awlaki as a luncheon speaker on Islam soon after September 11, according to documents recently uncovered by Fox News. Today, American drones are scouring Yemen in an effort to kill Awlaki, whose preaching has inspired dozens of terrorist attempts by Western Muslims. Unfortunately, there are not many success stories to offset these spectacular failures. The government has repeatedly demonstrated its inability to parse and evaluate Muslim thought and to identify moderate people and trends. These failures aren't just embarrassments. When we elevate hucksters like Alamoudi, it dismays and discourages those moderate Muslims who know better, and when we subsequently have to prosecute the hucksters, it alienates other Muslims who feel that the U.S. government is trying to silence the community's most prominent voices. Even when you move past such large-scale disasters, government efforts to engage American Muslims have fallen flat. Consider the Council on American-Islamic Relations, an occasional partner in the government's efforts to engage the Muslim community over the years. CAIR has been largely pushed out of those programs over the last couple of years due to its historical links to Hamas, its often unhelpful narrative about the perceived victimization of Muslims in America and its tendency to approach the issue of radicalization with a mix of denial and rationalization. While it has largely failed to satisfy its government constituents, CAIR also lacks credibility among radical-leaning Muslims, who routinely blast the organization as a snitch, a sellout and a passive collaborator in U.S. anti-Muslim policies. Similar complications apply for many other American Muslim leadership organizations of the moment. The best-funded (and thus most prominent) organizations get significant money and theological guidance from overseas. They aren't populist and do not offer a particularly comfortable space for less-religious Muslims to participate. Many of these groups also advance a watered-down version of the "war on Islam" narrative that is most important to violent radicalization, and not many can pass the white-glove test imposed by critics and watchdogs in political and media circles. But at the same time, these groups are too assimilated and conciliatory to possess credibility with the segments of the Muslim community most vulnerable to violent radicalization. There are other considerations as well, but all are variations on a single theme: Tackling extremism at the thought level is a complex endeavor with far more pitfalls than payoffs. Unlike racist radicals, Muslim extremists tend to focus on mass casualty attacks, rather than individual hate crimes. For that reason and others, the government will not let this issue go untended. But history suggests the CVE approach is ineffective at best, harmful at worst. In contrast, consider the following statistic. More than 180 homegrown extremists have tried to carry out terrorist attacks on U.S. soil since September 11. Only four have succeeded, thanks to old-fashioned counterterrorism. Many of those cases were cracked thanks to cooperation between American Muslims and law enforcement. That's an impressive track record, and our policy investments should be informed by that success. The vast majority of American Muslims oppose the acts of violence and terrorism carried out in their name by a handful of self-styled religious zealots who embrace the ideology of Al Qaeda. But the diversity of America's Muslim community makes it a challenge to develop critical mass for a legitimate grassroots movement that has both the credibility and will to fight radicalization directly. I'm an optimist. I believe that such a movement can and will develop, if Muslims are given space to process this issue from within. When Americans are asked by an indigenous, populist Muslim movement for help counteracting the poison of radicalization, we should give it. Until then, we should stay out of the way. J.M. 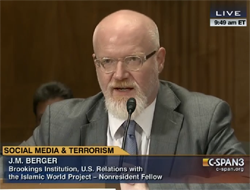 Berger is author of the new book, Jihad Joe: Americans Who Go to War in the Name of Islam.